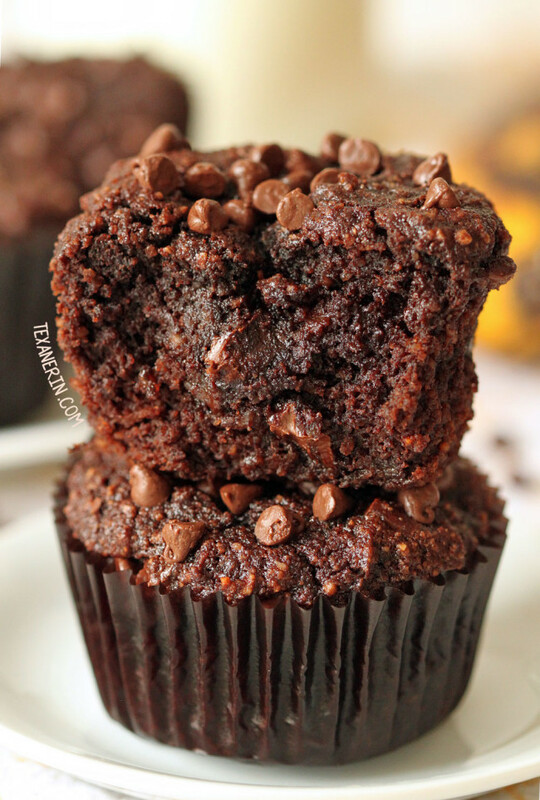 These fudgy paleo chocolate banana muffins are super rich and decadent! They’re also naturally sweetened with honey and are grain-free, gluten-free and dairy-free. When I make muffins, I’m usually able to eat at least three or four before I feel even the slightest bit full (I have to admit that I’m kind of a piggie). But these chocolate banana muffins are so rich and filling I could hardly do one and a half. I suppose that’s not too surprising considering all the almond flour and chocolate in there! These gluten-free muffins have a really nice texture! They’re not quite fudgy, but definitely headed that way, which is probably another reason why I couldn’t handle eating several of these at once. So they’re dense, but a nice dense, and have a really nice crumb. And they definitely don’t have that typical paleo muffin texture! I don’t know about you, but I’ve had way too many bad grain-free muffins. For another paleo muffin recipe with an awesome texture, you have to try my paleo blueberry muffins! They’re magical. They’re almost like angel food-like in texture. These paleo apple muffins are also amazingly delicious! They have grated and chopped apples and loads of cinnamon for a lovely explosion of fall flavor. But back to today’s recipe! The banana taste is also pretty strong in these banana muffins so I wouldn’t recommend making these unless the idea of chocolate and banana appeals to you! I was kind of hoping to use up my bananas in these muffins and not have them taste like banana at all, but I’m still really pleased with how they came out. I haven’t tried subbing the banana with something else so I have no idea how that’d work. If you try using something else, let us know in the comments how it worked out! If you’d rather have something more traditional, try these guilt-free chocolate banana muffins from Noble Pig. These double chocolate banana quinoa muffins from A Dash of Sanity also sound delicious and interesting! 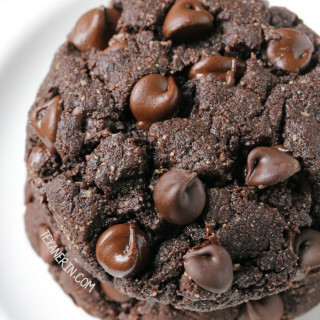 Want more paleo chocolate goodies? Preheat the oven to 350°F (175°C) and line a muffin tin with 12 muffin liners. In a large bowl, mash the bananas with the bottom of a glass. They should almost be like a puree. Add the honey and vanilla and stir. Add in the eggs and oil and stir until well combined. In a medium bowl, mix together the almond flour, coconut flour, cocoa powder, baking soda and salt. Stir just until combined and then stir in the chocolate chips. Spoon the batter into the muffin liners and sprinkle on additional chocolate chips, if desired. Bake for 18 minutes or until a toothpick inserted in the center comes out clean. Be careful not to confuse a melted chocolate chip with the batter. Let the muffins cool for 5 minutes in the pan and then turn out onto a wire rack to cool completely. Place in an airtight container and store in the refrigerator for up to 5 days. Use can use unrefined coconut oil if you don't mind a slight coconut taste. 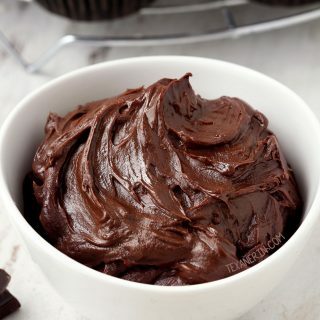 284 comments on “Paleo Chocolate Banana Muffins (grain-free, gluten-free, dairy-free)” — Add one! These are delicious. I usually skip mixing in the chocolate chips and put a few on the top of the muffin. I make these muffins regularly and carry them with me on the run, so much better than grabbing something from a store with empty calories. I like them as an on-the-go breakfast treat, too! So happy you enjoyed them. :) Thanks for your comment! O.M.G these are my absolute favorite treats I’ve ever made-hands down the BEST! I didn’t modify much except for 1/4 cup honey as I tend to like things on the less sweet side, and added 1/2 cup chopped walnuts. So amazing. A crowd pleaser!! Oh, wow. That’s awesome! I’m thrilled that you think they’re the best. :D Thanks a bunch for your feedback! Can I use something other than honey? I can’t have honey or white sugar. Maybe maple syrup or coconut sugar? Maple syrup would work! And sorry for just now seeing your comment. Love these ! Have made them twice, perfect recipe for using very ripe bananas and they are delicious! Thank you! Hi! I’m excited to see this recipe. I’m allergic to eggs, do you think it would work to omit the eggs and add an extra banana? Or replace the eggs with applesauce? Hi there! The only experience I have with egg replacers is with chia eggs (which I’m not positive would work in these – grain-free recipes and chia eggs aren’t always a sure thing) so I unfortunately have no idea how applesauce or banana would work. I’m sorry about that! Wish I could help more. 200 g does not equals to approximately 2 cups, not even close. Using digital scale here. 1 cup of almond flour is 100 grams. I use a digital scale and cups to ensure accuracy. If you google “1 cup of almond flour in grams” you’ll find other sites saying around 95-105 grams of almond flour per cup. These are awesome!!!! Rich, moist and so quick and easy to make. The taste of banana, chocolate and coconut were in each yummy bite. 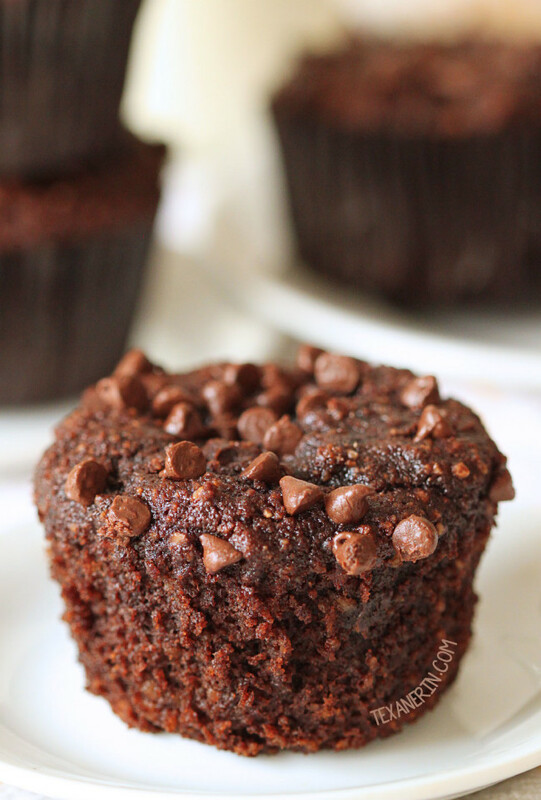 I have these paleo pumpkin muffins but they’re not fudgy like these chocolate banana muffins. I’ve never had a fudgy pumpkin muffin but it’d be nice. 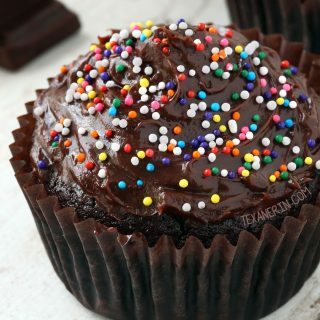 ;) So happy you liked the chocolate muffins! Hi, I stumbled upon your website and love them! I would love to try this recipe but I am allergic towards almonds. Can I replace it with coconut flour instead? Hi there! So happy you like the site. :) Coconut flour is unfortunately not interchangeable with any other flour as it absorbs so much more liquid. Sorry about that! Is it just me or do these muffins get even better out of the fridge?! They taste even more chocolatey some how! Aww, thank you! I’m thrilled that you and your daughter can eat them without issue and that you like them! Good paleo muffin recipes are hard to find. I can highly recommend my paleo apple muffins and paleo blueberry muffins if you want to try something else. :) Thanks for your comment! I’m a baker, and I don’t specialize in gluten free, dairy free or Paleo baking so when a customer requested muffins that were gluten/dairy free I was rather nervous… All of the recipes I’ve tried in the past have been, for one reason or another, awful!! I was skeptical of this recipe since the batter is a little more runny than I’m used to. But I’m happy to say this turned out perfectly! These were actually some of the best muffins I’ve had, gluten free or otherwise! Next time I’d reduce the honey as I found them a bit too sweet for my liking, but otherwise these will definitely be my go-to gf/DF/paleo muffins! Thank you! Wow, thanks! So happy that you liked them so much. :) And that’s great that you found a paleo recipe that isn’t awful! I know how bad they can be. ;) Thanks a ton for your comment! I hope your customer was happy with them. AMAZING! Wouldn’t change a thing! I had all the ingredients except the chocolate chips and they turned out great without them. Awesome! So happy you liked them. :) Thanks for your comment! I’ve made these muffins a bunch of times and my family loves them. I recently had a bunch of zucchini to use up and after unsuccessfully searching for a gluten and dairy free recipe that looked appealing I thought I’d try adapting this one and they turned out great. I subbed the banana for equal parts zucchini (peel included) and I was a little worried that the zucchini flavor might be too strong so I added a tsp of cinnamon. I’m too lazy to grate the zucchini so I threw it along with all the wet ingredients in the blender. Also added two tbsp of ground flax seed to the dry ingredients, just for kicks. Love your recipes! Thanks so much! I can’t wait to give these a try! Have you ever tries substituting pumpkin instead of the banana? They are similar texture. 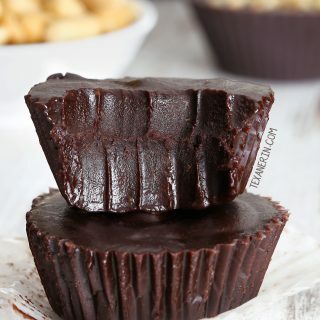 This recipe is my “go to” for a chocolate fix. I love it! My kids love this treat. Thanks for sharing Erin! I make enough to freeze for later and place in toaster to heat up. Just as good as when it’s baked. Yummy! Hey! Sound delicious! I will try them today without the banana. Hope will be he same. Thanks! Hi there! This recipe won’t come out as it’s supposed to (and I’m thinking it’d just be a huge disaster) without the bananas. I recommend finding a different recipe for chocolate muffins if you don’t have any bananas. 2 bananas (about 300 grams) is just too much to omit from a recipe. Sorry about that! These were so good! I recently found your website and have been loving your recipes. Awesome! I’m so happy you’re loving the recipes. :) Thanks for your comment! I RARELY make comments on recipes I’ve tried but I had to come back and do so. OMG these are sooooo yummy! Definitely a keeper! Made exactly per recipe and wouldn’t change a thing! Thank you! GORGEOUS!!!! I have tried many healthy muffins and never found one that I loved and that tasted good.These are gorgeous, thank you!!! Woohoo! So happy that you finally found one you like. :) Thanks for your comment and sorry for the slow reply! I’m in the process of moving and haven’t had internet since Sunday. That’s great that they worked well with less honey! Thanks for the tip. :) So happy you liked them! Thanks for your comment. Has anyone tried using pumpkin in place of the oil? Would that still work? I haven’t but I don’t think the mix of banana + pumpkin would be very good. I could be wrong, though! You could replace the pumpkin for the banana for less carbs and I use ideal protein maple syrup that has no carbs or sugar instead of the honey, turned out great :) I usually don’t trust many recipes on line, just made them and their fantastic!! I’m happy you enjoyed them! Did you actually try them with pumpkin or are you just suggesting it? Just asking because I know other people are curious. :) Thanks for your comment! Thanks for the recipe! I’m making my second batch in a week as my little boys love them. Kind regards from New Zealand! You’re welcome! I’m happy to hear that your boys love them. :) And hello to you from Berlin! LOVE this recipe!! Thank you for posting. My teen son was diagnosed with celiac disease last year and he loves muffins so he flipped for these!! They are super yummy!! I’d like to up the protein in these. Could I add protein powder do you think? If so, how would you suggest i alter the flour amounts? Thanks! I’ve never used protein powder before so I really have no idea. Sorry about that! I’m wondering how to convert this into a cake? Is that even possible? lol! I haven’t tried it so I’m not really sure. Sometimes muffins don’t translate well to cakes and vice versa. I also don’t know what size pan you’d need. Maybe a round 8″? But it just a guess! Sorry I’m not any help. If you try it out, I’d love to hear how it goes! Okay, i am now officially stalking your website! I am gonna try all the paleo, gluten free desserts you have here! I just made these muffins, and i am at a loss for words. They are soft, fluffy, and sooo good! I may have just found my baking guru! I love it! Expect more comments from me on your other recipes soon! Lol i’m a fan! Haha, aww. Yay! I’m so happy to be someone’s guru and to have a website stalker. :D I hope you’ll enjoy the other recipes just as much! If you loved these, I recommend the healthier carrot cake cupcakes (they’re really muffins), paleo blueberry muffins and paleo apple muffins. :) Thanks a bunch for your comment! I’m so sorry for just now seeing your comment, Emily! I don’t know how I missed it. And aww. That’s so cute that your little one wanted the muffin crumb! I love that your kids run to the table for the muffins. :) Thanks so much for your kind comment and sorry again for my slowness! I substituted cherries for most of the banana (pureed together in a handi chopper) and they turned out fabulous! Thank you for the wonderful recipe. These are simply the most delicious mouth watering muffins that I´ve ever baked! A zillion thanks for the recipe! Rgds from Copenhagen! Could you replace the bananas with pumpkin puree? I’ve never had good luck with that sub. I haven’t tried it here but I’m not very hopeful it’d work! Sorry about that. I just made these – fabulous! After reading others’ comments I made the following small tweaks: used 3T pure maple syrup since I didn’t have honey, separated the eggs, whipped the whites stiff and folded into the batter; used 1/2 cup mini semi-sweet chips; AND made MINI muffins! As for separating the eggs, I haven’t made the recipe as written so I can’t comment on textural differences but I love the texture – rich but light in a way! I greased the mini muffin pans with coconut oil and dusted them with coconut flour (no mini liners in the pantry). I made 28 as I was afraid to overfill the pans but it would have been fine to divy up the batter for 24 MINIs. I baked them for 12 min total with several interim checks, cooled for 5 min and they came out ot fhe pans just fine! These are a real hit! Thanks! Wow! That’s great that all your subs and changes worked out well. :) I still have to try that whipping the egg whites thing! I love how fudgy the recipe is as written so I’ve been hesitant to try. ;) Thanks a ton for sharing all your tips on how to make them as minis! Can you use all almond flour and no coconut flour? Unfortunately, coconut flour’s not interchangeable with any other type of flour as it absorbs so much more liquid. Sorry about that! I’d recommend a different recipe you don’t have access to coconut flour. I substituted the coconut flour for 3 tablespoons of cocoa chia flax mixture from Whole Foods. Worked great for me and very tasty! These are the best muffins ever, I couldn’t stop eating them and my kids loved them too. Thank you! Oooh! That’s an interesting sub. :) I’m so happy it worked out! What is the brand? I’ve never heard of cocoa chia flax! That’s great that you and your kids enjoyed them so much. Thank you for your feedback and the tip! Wow. These are excellent! I added only about 3/4 cups of chocolate chips and found that enough for me. I separated the eggs and whipped the egg whites. I stirred them in gently at the end after the other wet and dry ingredients were mixed well. Instead of 12 muffins I made 6 large ones (yummy….). I added about 7 minutes to the baking time. I’m so happy you enjoyed them! I’d be interested to try your version to see how whipping the egg whites affects the texture. Sounds good. :) Thanks for your tip and your feedback! I used less than 1/4 c. Honey and they are perfect! Awesome. I added nuts. YUMMMMMMY. Will definitely make them again. You can omit the chocolate chips but they won’t be nearly as delicious. ;) But you can’t omit or sub anything for the cocoa powder. Is there a substitute for almond flour? It’s one of our allergies but this recipe looks good! Thanks! You could try another type of nut flour. If you can’t do nuts at all, I’ve heard of people using sunflower seed flour but I’ve never tried it and have no idea if it’d work here. Sorry about that! I didn’t have much almond flour left in my pantry, so I ground up some oats for oat flour instead. They had a slightly chewier texture but otherwise were moist and delicious! Interesting sub! I’m happy it worked out. :) Thanks for your feedback! I had some very ripe bananas when I made this so instead of honey I used maple syrup. I also put chopped pecans as a topping. I love them! Thanks for sharing. Good to know that maple syrup works well! And I love your chopped pecan addition. :) Thanks for your tips! Aww, yay! I’m thrilled to hear that they seemed to have been a hit. :) Thanks for your comment! Made these with two really ripe yellow plantains…so so good! One of my favorite muffin recipes!! We make these all the time. We are out of honey, could we sub maple syrup? I just made these with maple syrup instead of honey and they turned out very well. Thanks for the recipe! Awesome! It’s great to know that maple works well. :) Thanks for your comment! Just made these and they turned out DELICIOUS!! My main issue is that I entered all the ingredients into My Fitness Pal (an app. to track calories and nutrients) and these are super high in carbs (30 g) and low in protein (around 6 g). Is this because of the bananas? I made it. It was delicious!!! Awesome! So happy to hear that. :) Thanks for your feedback! Is it 1 cup coconut oil as it says 1 four cup? Is it 1 cup choc chips total?? It says 1/4 cup coconut oil. Do you not see the same? If not, try viewing in another browser. :) It’s 1 cup chocolate chips unless you want to sprinkle more on top. I hope you’ll enjoy them! Waaaayyyy better than expected! Amazing! Yay! So happy you liked them. Thanks for your comment! Am I able to make these into a loaf instead of muffins?